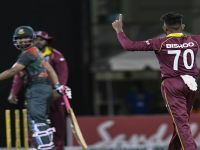 Off-spinner Mehidy Hasan Miraz claimed a career-best 12 wickets as Bangladesh thumped West Indies by an innings and 184 runs in Dhaka on Sunday to sweep the two-match series. Miraz picked up his fifth wicket of the second innings by dismissing JA Warrican. He had earlier taken a career-best 7-58 in the first innings to force the West Indies to follow-on. The performance broke Bangladesh’s Test match record with 12-117 over the course of two innings. Miraz had held the previous record with 12-159 against England. Shimron Hetmyer, one of his victims, had been the only major obstacle to the Tigers, posting 93. A late 37* from Kemar Roach finally took West Indies to 213 in the second innings after they took the follow-on. This match was the first time Bangladesh has ever enforced a follow-on. Taijul Islam picked up three wickets, while Nayeem Hasan has one. Shakib Al Hasan took the wicket of West Indies skipper Kraigg Brathwaite to add to his three in the first innings. It was Bangladesh’s first Test series win in four years after they won the opener in Chittagong by 64 runs. Earlier in the day, Mahmudullah has scored his third Test century, achieving a career best of 136 to take the Tigers to a massive total of 508. Bangladesh also saw half-centuries from debutant Shadman Islam (76), captain Shakib Al Hasan (80) and Liton Das (53). Kemar Roach, Devendra Bishoo, Jomel Warrican, and captain Kraigg Brathwaite picked up a couple of wickets each for the West Indies, while Shermon Lewis and Roston Chase split the remaining two. But Mehidy stopped Hetmyer from scoring his maiden Test century when the batsman went for a 10th sixth but wound up delivering it to Mohammad Mithun at long-on. He then removed Jomel Warrican to complete his second five-wicket haul of the game before finishing with match figures of 12-117 — the best ever Test haul for a Bangladeshi bowler. Bangladesh captain Shakib Al Hasan hailed his team’s effort after the match. “We did the process right and we did well in every department. Overall a very good team effort,” he said. West Indies’ trouble began from the very start of the third day’s play when they lost five wickets in less than an hour, after resuming their first innings on 75-5. Bangladesh never looked back as Mehidy claimed three more wickets in quick time before Shakib wrapped up the innings to finish with 3-27. “As batsmen, we didn’t do our jobs. We didn’t get a partnership and we let ourselves down on the field,” he said.